The industry's leading commercial grade ball winder for stores, professionals, and consumers. This ball winder can wind up to 1 Lb. balls. Unit can also be motorized and meterized (extra cost options). Made of Maple hardwood and heavy duty steel shafts and Swiss gears. Over 10,000 sold Worldwide since 2006. Made in the USA. Weighs 7 Lbs. The Std. Spindle is what most users need. The Small Diameter Spindle is for making smaller balls with smaller center holes BUT it cannot make really large balls (greater than 4-5 ounces). A Super Small Spindle is also available as a free-standing option (see spare parts). This unit comes with the standard size 5/16" orifice pigtail yarn guide. If buyer selects the Large Pigtail, they will get both the Std. diameter and the Large orifice pigtail tensioner posts. I love my Ball winder. I get my winding done in half the time it took me with my old winder. The service and delivery was awesome. Highly recommend this establishment. 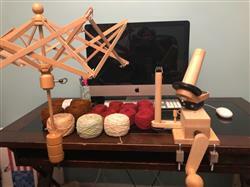 I am very pleased with the yarn winder. It will last me a lifetime. The customer service at Paradise Fibers was fantastic. Delivery was extremely fast. I’m delighted.